FIFA assigns a three-letter country code (more properly termed a trigramme or trigram) to each of its member and non-member countries. These are the official codes used by FIFA and its continental confederations (AFC, CAF, CONCACAF, CONMEBOL, OFC and UEFA) as name abbreviations of countries and dependent areas, in official competitions. There are currently 211 FIFA members, each one with its unique country code. The following codes refer to countries or dependent areas that are currently not affiliated with FIFA, but whose codes either appear in the FIFA results database, or are used regularly by confederation websites. The following codes refer to countries or dependent areas that are currently not affiliated with FIFA. Even though they are members or associate members of their regional confederations, these codes are not regularly used in communications of FIFA. The following codes are obsolete because a country has ceased to exist, changed its name, changed its code, or has become part of another country. ^ "Associations". FIFA.com. Retrieved 14 November 2015. The South American Football Confederation is the continental governing body of association football in South America and it is one of FIFAs six continental confederations. The oldest continental confederation in the world, its headquarters are located in Luque, Paraguay, CONMEBOL is responsible for the organization and governance of South American footballs major international tournaments. With 10 member football associations, it has the fewest members of all the confederations in FIFA, CONMEBOL national teams have won nine FIFA World Cups, and CONMEBOL clubs have won 22 Intercontinental Cups and four FIFA Club World Cups. Argentina and Uruguay have won two Olympic gold medals each, Brazil has won one Olympic gold medal and it is considered one of the strongest confederations in the world. Currently, the Confederation is planning to create the first womens qualification to the FIFA Womens World Cup to replace the Copa América Femenina. Juan Ángel Napout was the president of CONMEBOL until December 3,2015 when he was arrested in a raid in Switzerland as part of the U. S.
Justice Departments widening bribery case involving FIFA. Wilmar Valdez was interim president until January 26,2016 when Alejandro Domínguez was elected president, the first and second vice-presidents are Ramón Jesurum and Laureano González. The four participating associations of that tournament gathered together in order to create a governing body to facilitate the organization of the tournament. The constitutional congress on December 15 of that same year ratified the decision, over the years, the other football associations in South America joined, with the last being Venezuela in 1952. Guyana and the French overseas department of French Guiana, with ten member nations, CONMEBOL is the smallest and the only fully continental land-based FIFA confederation. The main competition for national teams is the Copa América. CONMEBOL runs national competitions at Under-20, Under-17 and Under-15 levels, for womens national teams, CONMEBOL operates the Copa América Femenina for senior national sides, as well as Under-20 and Under-17 championships. The Costa Rica national football team represents Costa Rica in international mens football. Costa Rica is administered by the Costa Rican Football Federation, the body for football in Costa Rica. The national football team of Costa Rica are the current Central American champions after winning the 2014 edition of the tournament. Costa Rica is the most successful football team in the history of Central America. They are one of the most successful teams in CONCACAF with three titles, Costa Rica is the only national team in Central America to have played in four FIFA World Cup editions. They managed to qualify for the 2002 and 2006 FIFA World Cups, in 2014, Costa Rica made their best performance in history by finishing first in their group that consisted of three former World Cup champions, Uruguay and England. During the Round of 16 they defeated Greece 5–3 via a penalty shootout after a 1–1 draw, reaching the quarterfinals for their very first time the Ticos were defeated by the Netherlands in a penalty shootout after a scoreless draw on 5 July. Costa Rica has a football culture and tradition. 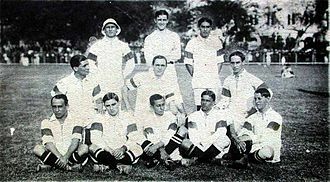 The national team made its debut in the Independence Centenary Games held in Guatemala City in September 1921, in the final, Costa Rica defeated 6–0 Guatemala to claim the trophy. The football team of Costa Rica has been characterized above all by its regularity over the years, well remembered is the selection of this country formed in the late 1940s acquiring the nickname of The Gold Shorties. Throughout the 50s and 60s, they were much the second strongest team in the CONCACAF zone behind Mexico. Stars of the side during this period were Ruben Jimenez, Errol Daniels, Leonel Hernandez and Edgar Marin. However, at the end of the 60s their fortunes would decline as other teams in the such as Guatemala, Honduras, El Salvador, Trinidad & Tobago. Although the majority of participants have been short on points in their World Cup performances. During the 1970s and most of the 1980s, the Costa Rican team went unnoticed, Costa Rica failed to make the final round of CONCACAF World Cup qualifying rounds until the 1986 qualifier. The Bosnia and Herzegovina national football team, represents Bosnia and Herzegovina in association football and is governed by the Football Association of Bosnia and Herzegovina. Until 1992, Bosnian and Herzegovinian players were part of the Yugoslavia national football team and Herzegovina achieved their best result when they reached the 2014 FIFA World Cup as winners of their qualifying group. They were eliminated after group stage narrow losses to Argentina and Nigeria and Herzegovinas home ground is Bilino Polje Stadium in the city of Zenica. The teams highest FIFA World Ranking was 13th in August 2013, Bosnia and Herzegovina have seen a steady rise in their fortunes on the international football stage in recent times. Historically, Bosnia, a war torn and divided nation, has managed multiple playoff appearances and has qualified to one FIFA World Cup, more often than not, the team produces solid results in qualifiers and challenges for a top spot. From 1920 to 1992, the players lined out for Yugoslavia, but following the outbreak of the Bosnian war and subsequent independence, the early period saw Bosnia-Herzegovina have to wait until the 1998 FIFA World Cup qualifiers to compete for a place in a major competition. Bosnia finished fourth in a group that included Greece and this was subsequently followed by further disappointment with lackluster campaigns in the UEFA Euro 2000 qualifiers, as well as the 2002 FIFA World Cup. This early period was followed by Bosnia coming very close to qualifying directly for their first ever major competition, UEFA Euro 2004, narrowly missing out by a single goal against Denmark. Bosnia failed to make the grade in the 2006 FIFA World Cup qualifiers, despite being unbeaten at home, and the UEFA Euro 2008 qualifiers, which saw their poor home form cost them. Bosnia managed to finish a third in a group which included Argentina at their first ever major competition. Nigeria pipped Bosnia for second place in the group with a 1–0 win marred with controversy following an incorrectly disallowed goal scored by Edin Džeko in the first half, Bosnia finished third in the UEFA Euro 2016 qualifiers behind Belgium and Wales. After the slow start, the Bosnian performance improved dramatically, with five wins in their six matches, including victories over Wales. The Armenia national football team represents Armenia in association football and is controlled by the Football Federation of Armenia, the governing body for football in Armenia. After gaining independence from the Soviet Union, the team played its first international match on October 12,1992, Armenias home ground is the Republican Stadium in Yerevan and their head coach is Artur Petrosyan. Armenia became an independent state in 1991, the Armenian SSR having previously played for the Soviet Union national football team, the Football Federation of Armenia was founded on 18 January 1992 and established relations with FIFA in 1992 and with UEFA in 1993. The history of the Armenia national team began on 14 October 1992 and that meeting ended in a goalless draw. Since 1996, the team is a member of qualifiers European, Armenia has competed in every UEFA Euro qualification and FIFA World Cup qualification since 1994. The first head coach of the Armenian national squad was Soviet Armenian football star Eduard Markarov, Armenian winner of the UEFA Jubilee Awards and fellow Soviet Armenian football great Khoren Hovhannisyan became a head coach. Many of the coaches of the national team never stayed for longer than two years. Scottish coach Ian Porterfield became head coach in 2006 and began to lead the team to some of its first successes in the international stage. Under his leadership, the Armenian team had played a series of matches with victories over Kazakhstan 2–1, Poland 1–0 and Portugal 1–1. But tragedy struck, the 62-year-old Porterfield died of cancer, an acting assistant coach, Vardan Minasyan, became acting head coach following Porterfields death. Minasyan learned much from Porterfield and Samvel Darbinyan, another head coach of Armenia. 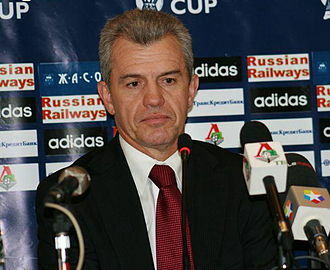 In the UEFA Euro 2012 qualifying matches, Minasyan led Armenia in Group B against Russia, Ireland, the Armenian team scored the most goals out of Group B, with a total of 22. Henrikh Mkhitaryan of Armenia scored 6 goals, the most goals scored by a player in Group B. The national team almost made the draw, but controversially lost in a decisive match against Ireland 1–2. Armenian goalkeeper Roman Berezovsky was given a red card by Spanish referee Eduardo Gonzalez at the 26th-minute for supposedly touching the ball outside the goal area, replays clearly showed the ball touched his chest and never touched his hands. The official nickname of the Antigua and Barbuda national football team is The Benna Boys due to the indigenous music of the country. The name was selected in a contest with the fanbase in 2012 after the team advanced to the round of the 2014 World Cup qualifiers. The Benna Boys beat out other entries in the contest such as Beach Boys, Iron Bandits, Rhythm Warriors, in the past, the national team was unofficially known as the Wadadli Boys, another name that was in the contest but did not win. Trinidad and Tobago won the first match 11–1, making this result Antigua, the Soca Warriors won the second leg in St. Johns, Antigua 2–1 nine days later. The 1998 Caribbean Cup, hosted by Jamaica and Trinidad and Tobago, saw Antigua and Barbuda, led by Serbian coach Zoran Vraneš, in the qualifying round, the Benna Boys had an unbeaten string of matches securing progression to group stages of the finals. Antigua were placed in Group 4, along with Grenada, Guyana, a 2–2 draw to Guyana in the opening game was followed by a 7–0 thrashing of Anguilla – in which The Benna Boys were rampant. All this before a narrow 2–1 victory over Grenada, who finished in second spot on 6 points, Winning two matches and drawing one saw Antigua and Barbuda topped the group with 7 points, sealing their progression to the group stage of the Caribbean Cup Finals. In the group stage, there were two groups and Barbuda were put into Group A with their first match coming against a very talented Trinidad and Tobago team, a match they narrowly lost 3–2. The performances in the three matches saw Antigua and Barbuda get second place in the group and qualify for the knockout phase of the tournament. The Benna Boys first and only qualification to the knockout round saw them pitted against the favourites of the tournament. That would produce a magnificent encounter, with Antigua ending up the team in a five-goal thriller. Vaughn Christopher and Ranjae Christian bagged the duo of goals for Antigua and Barbuda but it wasn’t enough to grab third place, to this day, placing fourth in this edition of the Caribbean Cup is the highest achievement for the Benna Boys. The Bahrain national football team is the national team of the Kingdom of Bahrain and is controlled by the Bahrain Football Association, which was founded in 1951 and joined FIFA in 1966. They have never reached the finals of the World Cup, but have come within one match of doing so. Bahrain won the FIFAs most improved team award in 2004, and finished fourth in the 2004 Asian Cup, beating Uzbekistan in the quarter-finals, Bahrain lost to Iran in the third-place match, thus finishing in fourth place overall. This allowed Bahrain to enter another two-legged playoff with the fourth-placed CONCACAF nation, but a 0–1 Bahrain loss in Manama after a 1–1 draw in Port of Spain saw the CONCACAF nation go through. 2006 FIFA World Cup qualification - AFC Fourth Round play-offs,2006 FIFA World Cup qualification play-offs, Bahrain fielded a side which was essentially the Olympic team against Australia, and they lost 2–0. Bahrain qualified for the Asian Cup 2007 after defeating Kuwait in their last match, Bahrain were knocked out in the group stages via two losses against Indonesia and Saudi Arabia, despite a win against Korea Republic. 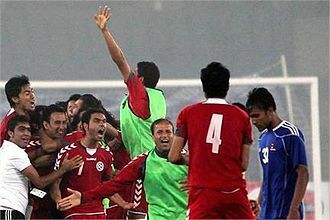 In the third round of the 2010 FIFA World Cup qualifiers, Bahrain were drawn into group B along with Japan and Thailand. They finished second overall to qualify to the round, in which Bahrain finished third overall in their group, below Australia and Japan. 2010 FIFA World Cup qualification – AFC Fifth Round play-offs, AFC 5th place v OFC winner play-offs, In 2014 FIFA World Cup qualification, in the third round, they were drawn against Indonesia and Qatar. Although they managed to defeat Indonesia both home and away, they got thrashed 6–0 by Iran away from home, although they had a higher goal difference than Qatar, they needed an extra point to advance to the next round. If they had drawn to Iran away from home, they would have advanced, but they failed to do so, and their campaign ended in the third round, their worst result since 2006 qualification. Win Draw Loss The following players were called up for the 2015 AFC Asian Cup. Caps, the following players have been called up for the Bahrain squad within the last twelve months. The Argentina national football team represents Argentina in football and is controlled by the Argentine Football Association, the governing body for football in Argentina. Argentinas home stadium is Estadio Monumental Antonio Vespucio Liberti in Buenos Aires, la Selección, known as the Albicelestes, has appeared in five World Cup finals, including the first final in 1930, which they lost 4–2 to Uruguay. Argentina won in their final appearance in 1978, beating the Netherlands at extra time. Argentina, led by Diego Maradona won again in 1986, a 3–2 victory over West Germany and they again made the World Cup finals in 1990, and lost 1–0 to West Germany following a controversial penalty call in the 87th minute. Argentina made their appearance in a World Cup final in 2014, again losing to Germany. Argentinas World Cup winning managers are César Luis Menotti in 1978, Argentina has been very successful in the Copa América, winning it 14 times and winning the extra South American Championships in 1941,1945 and 1946. The team won the FIFA Confederations Cup and the Kirin Cup, both in 1992, and the Argentine olympic team won the Olympics football tournaments in Athens 2004 and Beijing 2008. Argentina and France are the national teams that have won the three most important mens titles recognized by FIFA, the World Cup, the Confederations Cup. They have won their continental championship. Argentina is known for having rivalries with Brazil, England, the first match ever recorded by Argentina was against Uruguay. 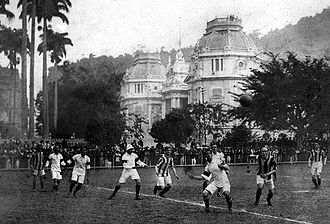 The game was held in Montevideo on 16 May 1901 and Argentina won 3–2, during the first years of its existence, the Argentina national team only played friendly matches against other South American teams. The reasons for this varied, including long travel times between countries and World War I, la Selección, known as the Albicelestes, has appeared in five World Cup finals, including the first final in 1930, which they lost, 4–2, to Uruguay. Argentina won in their final in 1978, beating the Netherlands. The Brazil national football team represents Brazil in international mens association football. Brazil is administered by the Brazilian Football Confederation, the body for football in Brazil. They have been a member of the FIFA since 1923 and member of the CONMEBOL since 1916, Brazil is the most successful national football team in the FIFA World Cup with five championships,1958,1962,1970,1994 and 2002. Brazil is the national team to have played in all World Cup editions without any absence nor need for playoffs. The seleção is the most successful team in the FIFA Confederations Cup with four titles,1997,2005,2009 and 2013. They have won their continental championship. Brazil is the national team to have won the World Cup on four different continents, once in Europe, once in South America, twice in North America. They share with Spain a record of 35 consecutive international matches undefeated, a common quip about football is, Os ingleses o inventaram, os brasileiros o aperfeiçoaram. Brazil won 2–0 with goals by Oswaldo Gomes and Osman, though it is claimed that the match was a 3–3 draw, in contrast to its future success, the national teams early appearances were not brilliant. Other early matches played during that time include several friendly games against Argentina, however, led by the goalscoring abilities of Arthur Friedenreich, they were victorious at home in the South American Championships in 1919, repeating their victory, at home, in 1922. In 1930, Brazil played in the first World Cup, held in Uruguay in 1930, the squad defeated Bolivia but lost to Yugoslavia, being eliminated from the competition. They lost in the first round to Spain in 1934 in Italy, Brazil were the only South American team to participate in this competition. 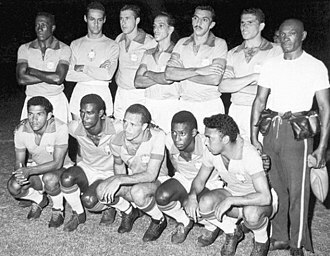 After being victorious in a third South American Championship in 1949 Brazil first achieved prominence when it hosted the 1950 FIFA World Cup. The team went into the last game of the round, against Uruguay at Estádio do Maracanã in Rio. Uruguay, won the match and the Cup in a known as the Maracanazo. 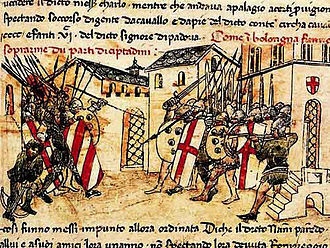 The match led to a period of national mourning, Brazil reached the quarter-final, where they were beaten 4–2 by tournament favourites Hungary in one of the ugliest matches in football history, known as the Battle of Berne. El Salvadors national football team represents El Salvador in international football and is controlled by the Salvadoran Football Federation. In 1899, two teams from Santa Ana and San Salvador met for the first known game in El Salvador. The national teams first match was played in September 1921, when they were invited to participate in a tournament to celebrate 100 years of Central American Independence. El Salvador has made two FIFA World Cup appearances, first in 1970 and again in 1982, but have never progressed beyond the first stage of a finals tournament and they were the 1943 CCCF champions, and finished in second-place in the 1941 and 1961 championships. They have competed in the CONCACAF regional tournaments fourteen times, finishing as runners-up in 1963 and 1981, La Selecta competes in the biennial UNCAF Nations Cup, the Pan American Games, the Olympics, and have achieved two gold medals in the Central American and Caribbean Games. The Estadio Cuscatlán, known as El Coloso de Montserrat, since 2008, the national team has had a kit sponsorship contract with England-based supplier Mitre. Raúl Díaz Arce is the all-time top-scorer for the team, with 39 goals, while Alfredo Pacheco has the most caps. Salvadoran football had its origins in the city of Santa Ana and this was the first time a football game was hosted in El Salvador. That first game took place on July 26,1899 among players from Santa Ana, both teams had several foreign players from England who are credited with introducing football to El Salvador. The home team won the game 2–0, in September 1921, El Salvador were invited to Guatemala to take part in the Independence Centenary Games, to celebrate 100 years of Central American Independence. The tournament was between Guatemala, Costa Rica, and El Salvador, the Guatemalans and Costa Ricans had more experience with football than the Salvadorans and Hondurans. It was a tournament with Guatemala playing Honduras and El Salvador playing Costa Rica. Alcaine, Guillermo Sandoval and Enrique Lindo, by halftime Costa Rica was up 3–0, and at the final whistle after 80 minutes won 7–0. The Colombia national football team represents Colombia in international football competitions and is overseen by the Colombian Football Federation. It is a member of the CONMEBOL and is ranked seventh in the FIFA World Rankings. The team are nicknamed Los Cafeteros due to the production in their country. Since the mid-1980s, the team has been a symbol fighting the countrys negative reputation. This has made the popular and made the national team a sign of nationalism, pride. Colombia is known for having a fan base. Colombia had its strongest period during the 1990s, a 1993 match resulted in a 5–0 win over Argentina which began a special mutual respect rivalry between both nations. The goalkeeper René Higuita achieved fame from his eccentric scorpion kick clearance against England at Wembley Stadium in 1995, stars from Colombias team included Carlos Valderrama and Faustino Asprilla. During this era Colombia qualified for the 1990,1994, and 1998 World Cups, following the death of Andrés Escobar after the 1994 World Cup, Colombias team faded in the latter half of the 1990s. They were the champions of the 2001 Copa América, which hosted and set a new Copa América record of conceding no goals. Prior to that success, they were runners-up to Peru in the 1975 Copa América, in total, Colombia has gained a top four result in seven Copa Américas. Colombia was the first team to win FIFA best mover in 1993 where the achievement was first introduced, Colombia missed three World Cups between 2002 and 2010. After a 16-year-long wait, in 2014 Colombia finally returned to the World Cup, where they were able to advance to the quarter-finals, Colombias midfielder James Rodríguez won two awards, the Golden Boot for most goals and Best Goal of the Tournament. The 1962 World Cup match against the Soviet Union finished in a 4–4 tie after Colombia had been down 4–1, in that game, Colombia scored a direct corner kick goal, making it the only direct corner kick goal in World Cup history. Colombia played its first official matches at the 1938 Central American and Caribbean Games, the Colombia national football team was composed mostly by all the players of the Club Juventud Bogotana. The team plays its home games at Borg El Arab Stadium in Alexandria, and their current head coach is Héctor Cúper. Egypt has been as high as ninth in the FIFA World Rankings, despite their continental record, Egypt has so far made only two appearances in the World Cup, failing to win a game on both occasions. 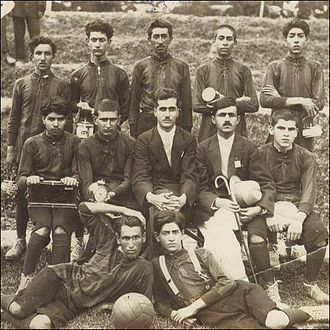 The Egypt national team was the first African and Middle Eastern team to qualify for the World Cup, the first Egyptian national football team was constituted in 1920 to compete in the Summer Olympics in Belgium. The opening match of their campaign was a loss against the Italians, Egypt qualified to the FIFA world cup twice in 1934 and 1990. Egypt was the first African country to qualify to the World Cup and lost to the Hungary 4–2 in their first and they only scored one goal in the 1990 World Cup scored by Magdy AbdelGhany to give the Egyptians their first point of the tournament. Egypt first participated in the first Africa Cup of Nations tournament in 1957, in their first game, which was a semi-final, they faced Sudan, winning 2–1 with goals from Raafat Attia and Ad-Diba, enabling Egypt to play in their first final. In the final, they faced Ethiopia, in which Egypt won 4–0, with goals being scored by Ad-Diba. The top scorer of tournament was Ad-Diba from Egypt with five goals. In their second participation in the Africa Cup of Nations in 1959, there were only three teams in that tournament, being Ethiopia and Egypt itself. Egypt again was undefeated in tournament, like in the previous tournament in 1957. Their fourth appearance came in 1963 in Ghana, Egypt was placed in Group B with Sudan and Nigeria, winning Nigeria with a score of 6–3, but drawing 2–2 against Sudan. Despite being undefeated in the stage, they were ranked second, behind Sudan by goal difference. Egypt, as runners-up in Group B, participated in the 3rd place match, playing against Ethiopia, for the 1965 Africa Cup of Nations, Egypt did qualify for the tournament, but they withdrew because of their diplomatic relationship with Tunisia, who were hosts of the tournament. Again, Egypt withdrew from the 1968 Africa Cup of Nations, in the 1970 Africa Cup of Nations, hosted again in Sudan, Egypt were in Group B along with Ghana and the Democratic Republic of the Congo, known as Congo-Kinshasa back then. The Croatia national football team represents Croatia in international football. The team is controlled by the Croatian Football Federation, the governing body of football. A FIFA-sanctioned national side previously represented the short-lived Banovina of Croatia and this team was dissolved in 1945 as Croatia became a constituent federal republic of SFR Yugoslavia. In the period between 1945 and 1990, Croatia was ineligible to field a team for competitive matches. The modern Croatian team was formed in 1990, shortly before Croatias independence from Yugoslavia, the team played their first competitive matches in the successful qualifying campaign for UEFA Euro 1996, leading to their first appearance at a major tournament. In Croatias FIFA World Cup debut in 1998 the team finished third and provided the top scorer. Since becoming eligible to compete in tournaments, Croatia have failed to qualify for only one World Cup. The team was undefeated in its first 36 home competitive matches at Maksimir, the teams traditional nickname is Vatreni. The team was named FIFAs Best Mover of the Year in 1994 and 1998, Association football was first introduced to Croatia by English expatriates working on industrial projects in Rijeka and Županja in 1873. By 1907, local clubs had established in Croatia and a modern edition of the sports laws was translated and published. A hastily arranged Croatian side, managed by Hugo Kinert, played a few matches in 1918–19, in 1940, Jozo Jakopić led an unofficial national team representing the Banovina of Croatia in four friendly matches, against Switzerland and Hungary. Following invasion by the Axis powers, the Croatian Football Federation became briefly active, joining FIFA on 17 July 1941, the side, led by Rudolf Hitrec, went on to play 15 friendly matches,14 of those as a member of FIFA. Croatias first recorded result as a FIFA member was a 1–1 draw with Slovakia on 8 September in Bratislava. The Independent State of Croatia continued playing matches until 1945 and the end of World War II, from 1950 to 1956, unofficial Croatian teams were briefly active—they won games against Indonesia and a Yugoslav team playing as Serbia. 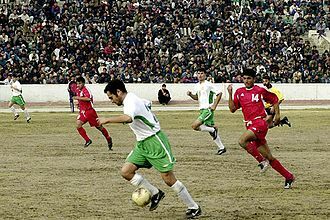 Match scene between Afghanistan and Turkmenistan in a FIFA World Cup qualification match in Kabul, 2003. Christian Panucci, the current manager of the Albania national football team. The Antigua and Barbuda national football team in Bungay, Suffolk, England on May 24th, 2008 after scrimmages against English lower division side Lowestoft Town. Kerry Skepple about to score the game-winning goal versus Haiti on November 11th, 2011 to advance to the third round of CONCACAF World Cup qualifying. 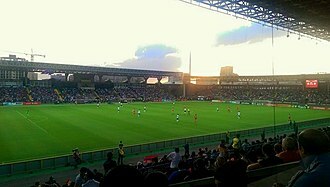 The Antigua and Barbuda national team in their historic World Cup 2014 qualifying match versus the United States on October 12th, 2012 at the Sir Vivian Richards Stadium. 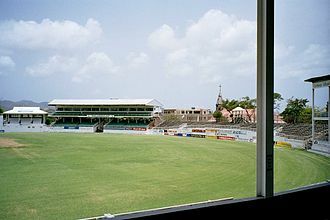 Antigua Recreation Ground, the original home venue of the Antigua and Barbuda national football team. Lionel Messi celebrating after scoring a crucial hat-trick against Ecuador on 10 October 2017. He is the highest goalscorer in the history of Argentina with 65 goals. Australia playing Uruguay at Stadium Australia to determine the last qualifying spots for the 2006 World Cup. Australia against Germany in Moses Mabhida Stadium, at the 2010 FIFA World Cup. Australia against Chile in Arena Pantanal, Cuiabá, at the 2014 FIFA World Cup. Andreas Herzog is the most capped player in the history of Austria with 103 caps. Anton "Toni" Polster is the top scorer in the history of Austria with 44 goals. Azerbaijan national football team in October 2013. The first Belgium A-squad in 1901 featured four Englishmen. In the 1920 Olympic football final at the Olympisch Stadion in Antwerp, Robert Coppée scored for Belgium with a penalty kick. Tshering Dorji scored the game-winner against Sri Lanka in Colombo. Bhutan Average Yearly FIFA Rankings 2000–2016. Bhutan Year End Elo Ratings 1984–2016. BiH squad post FIFA affiliation of late 90's. Edin Džeko is Bosnia's most capped player and all-time top goal scorer. The Chilean national team in 1982. The first recognised Croatian team played against Switzerland in 1940. The 1998 Third Place Certificate for Croatia. Croatian football fans during the 2001 international season. The 2002 Croatia's home jersey. Czech Republic (red) v Ghana (white) at the 2006 World Cup. Fernando Paternoster was the first foreign manager of the Colombia national team. He was also the one to coach Colombia to its first international game. The Argentine Adolfo Pedernera was the manager of Colombia during the 1962 World Cup. Iván Córdoba captained the Colombian team that won the 2001 Copa América, also scoring the sole goal in the final against Mexico. The Danish team that won their first Silver Medal at the 1908 Summer Olympics. Danish team, winning the Silver medals at the 1912 Olympics. Parken Stadium, with a capacity of 38,065 spectators, located in Copenhagen, and used as official home stadium by the Denmark national football team. Costa Rica national football team players celebrating their classification at the FIFA World Cup 2014 for the round of 16 in first place of Group D at Mineirão stadium in Belo Horizonte after their draw with England. Fans of the Angolan national football team in Cologne, Germany. 2012 Cyprus national football team in Bulgaria.